<>The world-wide developer community has downloaded over ten million copies of BIRT (Business Intelligence and Reporting Tools). Built on the open-source Eclipse platform, BIRT is a powerful reporting system that provides an end-to-end solution from creating and deploying reports to integrating report capabilities in enterprise applications. 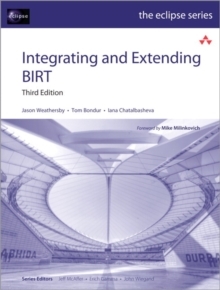 Integrating and Extending BIRT, Third Edition, introduces programmers to BIRT architecture and the reporting framework. BIRT technology makes it possible for programmers to build customized reports using scripting and BIRT APIs. 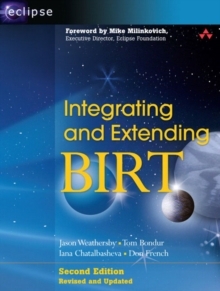 This book also includes extensive examples of how to use the Eclipse Plug-in Development Environment to build plug-ins to extend the features of the BIRT framework. The source code for these examples is available for download at www.eclipse.org/birt. Key topics covered includeInstalling and deploying BIRT Deploying a BIRT report to an application server Understanding BIRT architecture Scripting in a BIRT report design Integrating BIRT functionality into applications Working with the BIRT extension frameworkThis revised and expanded third edition features the following new contentUpdated architectural diagrams Expanded scripting examples Debugging event handlers Developing an advanced report item with data binding Developing a data extraction extension Developing a charting extension Readers may also be interested in this book's companion volume. BIRT: A Field Guide, Third Edition, is the authoritative guide to using BIRT Report Designer, the graphical tool that enables users of all levels to build reports, from simple to complex, without programming.